Upstate New York is the portion of the American state of New York lying north of the New York metropolitan area. The Upstate region includes most of the state of New York, excluding New York City, the Lower Hudson Valley, and Long Island, although the precise boundary is debated. Major cities in Upstate New York include Buffalo, Rochester, Albany, and Syracuse. Before the American Revolutionary War, Upstate was populated by Native Americans and was home to the Six Nations of the Iroquois Confederacy. The region saw many battles between the Continental Army and the Iroquois, and several treaties drawn up after the war ceded much of the land to settlers of European descent. It is largely rural with rugged terrain. 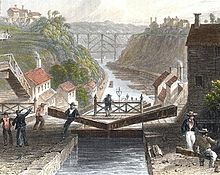 The development of Upstate New York was spurred by the opening of the Erie Canal in 1825, which greatly eased the transport of goods between the port of New York City and inland cities along the Great Lakes. As a result, Upstate became a hotbed for manufacturing, giving birth to such firms as General Electric, IBM, Kodak, and Xerox, and it welcomed a large influx of immigrants. Since the mid 20th century, American de-industrialization has contributed to economic and population decline Upstate, and the region is largely considered part of the Rust Belt. Unlike the New York metropolitan area, Upstate New York contains vast areas of rural land. As a result, Upstate also supports a strong agriculture industry, and is notable for its milk and other dairy products, its fruit production (especially apples), and winemaking. New York City is dependent on the natural resources of Upstate for a variety of services, including the city's water supply and electricity. The region is home to several popular tourist and recreational destinations, including Niagara Falls, the Adirondack and Catskill Mountains, and the Finger Lakes. The Bear Mountain Bridge across the Hudson River, as seen from Bear Mountain. There is no clear official boundary between Upstate New York and Downstate New York. The most expansive definition of the term Upstate New York excludes only New York City and Long Island, which are always considered to be part of Downstate New York; this usage is common among New York City residents. Yet another usage follows the U.S. Census definition of the New York metropolitan area prior to 2010, which included Westchester, Rockland, and Putnam Counties. This was the definition used by the plaintiffs in the federal redistricting case Rodriguez v. Pataki. 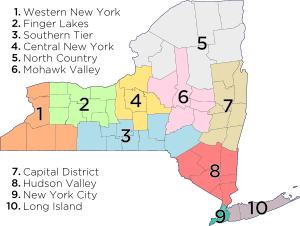 In New York State law, the definition of the Upstate boundary also varies: while Westchester is seemingly always considered downstate under state law, some definitions include Rockland and Putnam Counties in the downstate region, and others also include Orange and Dutchess Counties; all of these counties are served by Metro-North Railroad lines. Ulster County, and, in the largest state-defined extent of downstate, Columbia County, are also sometimes included. The division line between the United States District Court for the Southern District of New York and the United States District Court for the Northern District of New York places Sullivan County and Dutchess County in the Southern District, and Ulster and Columbia Counties in the Northern District. Within New York State, surveys have had difficulty determining a consensus. In a 2016 poll of New York voters in which respondents were asked to choose among four definitions of where Upstate begins, three were about equally common, selected by between 25% and 30% of respondents each: north of New York City, north of Westchester County, and north of Poughkeepsie in Dutchess County. (The fourth, which also stated north of Poughkeepsie but excluded Buffalo as a unique region neither Upstate nor Downstate, drew only 7%.) An informal 2018 poll found the Hudson Valley region is the most heavily disputed area regarding whether it is Upstate or Downstate. Residents of Upstate New York sometimes prefer to identify with a more specific subregion, such as Western New York or Central New York. A number of businesses and institutions in the area have "Upstate" as part of their name. Examples of this include the State University of New York Upstate Medical University in Syracuse, the Upstate New York Chapter of the Arthritis Foundation serving 31 of New York's 62 counties, and the VA Healthcare Network Upstate New York, which includes all of New York State northward and westward from Kingston, New York in Ulster County. Other organizations in New York with "Upstate" in their name include the Upstate Collegiate Athletic Association (now known as the Liberty League), the Upstate Correctional Facility, the Upstate New York Club Hockey League, the Upstate New York Synod, and the Upstate Citizens for Equality. Linguistically, upstate New York from Western New York east to Utica is part of the Inland North region of American English dialectology, a region which includes Midwestern cities as far west as Chicago and Milwaukee. The Hudson and lower Mohawk Valley has more in common dialectologically with western New England and New York City. The boundary between the use of the words pop and soda to refer to soft drinks, however, falls farther west than the edge of the Inland North, running just to around the city of Rochester: Buffalo and areas west of Rochester use pop, like the rest of the Inland North to the west, whereas areas east of Rochester, like Syracuse and Binghamton, use soda, like New England and New York City. In Ithaca and Elmira, the border is less clear, with some people having grown up with pop and some with soda; however, current trends see Ithaca, at least, turning to mostly "soda." Although one local legend lays claim that the potato chip was invented in Saratoga Springs, it has achieved such universal popularity that it is no longer identified with the region. Winemaking is a growing industry in the Finger Lakes as well as in Chautauqua County, where Welch's operates one of the oldest extant grape juice factories in the United States. In the center of the Finger Lakes region, Ithaca is known for the Bo Burger, a cheeseburger with a fried egg on top. Some literary, documentary and cinematic depictions of upstate present a sense of small town, simple lifestyles, such as It's a Wonderful Life, set in a small upstate town (probably based on Seneca Falls) in the 1940s. The population of New York State is 19,746,227, with 11,323,961 living in either New York City or Long Island,[when?] leaving only 8,422,266 for the entire rest of the state. This means Upstate NY has a population density far lower than that of downstate. Upstate is typified by farmland and forest, many large lakes, and two (major) mountain ranges, with a few metro areas dotting the map here and there. Residents of English colonial ancestry are common, as well as German, Irish, and Italian, with most metropolitan counties having a similar number of residents from each group. The North Country is heavily French Canadian. Italian Americans are the largest ethnic group in Oneida County, as well as in some counties in the Hudson Valley that are closest to New York City. Irish Americans represent the largest ethnic group from the Capital District, Syracuse, Binghamton, and the rest of the Hudson Valley, though they also have large Italian American populations; Irish population is consistently above 15% in most of upstate New York (reaching over 20% in the upper Hudson Valley), compared to less than 8% in most of New York City. Buffalo also contains a notably large contingent of residents with Polish ancestry. African Americans, while not as numerous as in New York City, make up at least 25% of the residents in cities such as Buffalo, Rochester, Syracuse, and Albany. Upstate New York is well known for its cold and snowy winters, particularly in comparison to the more temperate climate of downstate New York. The snowy reputation is especially true for the cities of Buffalo, Rochester, Oswego and Syracuse, and is largely due to lake-effect snow from Lake Ontario and Lake Erie. The villages of Old Forge and Saranac Lake, both in the Adirondacks, often vie on winter nights with places like International Falls, Minnesota and Fargo, North Dakota for the coldest spot in the nation. In the eighteenth century, the British consolidated their hold on the region. William Johnson, a Scottish trader, established an estate in the Mohawk Valley, living among the Mohawk, learning their language, and forging an alliance with them. He was appointed as the British Indian agent to the Iroquois. The British also encouraged settlement in the Mohawk Valley by other Europeans, including German Palatines beginning in the 1720s. 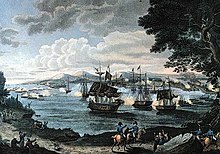 The British conquered New France by 1760 with the fall of Quebec. France formally ceded New France to the British in the Treaty of Paris of 1763. 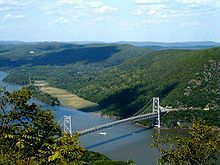 The same year, King George III issued the Royal Proclamation of 1763, which established the western and northern boundary of the Province of New York at the limits of the Hudson, Mohawk and Delaware River watersheds. The area between that boundary and the Great Lakes and Saint Lawrence River, including west of the Appalachian Mountains, was to be the "Indian Reserve." Between 1774 and 1783, deeply divided colonists waged civil war on each other directly and by proxy, through attacks such as the Seneca-led Cherry Valley and the Mohawk-led Cobleskill massacre. In 1779, the Sullivan Expedition, a campaign by the Continental Army ordered by General George Washington, drove thousands of the Haudenosaunee from their villages, farms and lands in the region in an effort to both avenge and prevent such attacks. After the American Revolution, the Treaty of Paris established the border between New York and British North America. The 45th Parallel became the border with Quebec or Lower Canada. The St. Lawrence River, Lake Ontario, the Niagara River and Lake Erie became the border with Upper Canada. Great Britain continued to occupy military installations along the American shores of the Great Lakes until 1794, including Fort Niagara at the mouth of the Niagara River and Fort Ontario at the mouth of the Oswego River. Battles of the War of 1812 (1812–1815) were fought on the Niagara Frontier, in the Champlain Valley, including the Battle of Plattsburgh, in the St. Lawrence Valley, and on Lake Ontario, including the Battle of Sackets Harbor. The city of Buffalo was razed by the British as well. After the war, the US Government began to construct Fort Montgomery just south of the border at Rouses Point on Lake Champlain. Subsequently, it was discovered that at that point, the actual 45th parallel was three-quarters of a mile south of the surveyed line, putting the Fort, which became known as "Fort Blunder", in Canada. This was not resolved until 1842 with the Webster-Ashburton Treaty, in which Great Britain and the United States decided to leave the border on the meandering line as surveyed. In the pre-Civil War era, Upstate New York became a major center of radical abolitionist activity and was an important nexus of the Underground Railroad. Resistance to the Fugitive Slave Act was particularly heated in the region, as evidenced by such events as the Jerry Rescue. The American women's rights movement was also born in Upstate New York at this time. The Seneca Falls Convention, the first women's rights convention, was held at Seneca Falls in 1848. The Rochester Convention, the second such convention, was held two weeks later in Rochester. Since the late 20th century, with the decline of manufacturing and its jobs, the area has generally suffered a net population loss, most heavily in Western New York. By contrast, many Amish and Mennonite families are recent arrivals to the area and have helped revive agriculture as part of the economy. Beginning in 1974, many Mennonite families moved to the Penn Yan area of Yates County from Lancaster County, Pennsylvania, seeking cheaper farmland. Amish communities have also been established in St. Lawrence, Montgomery, Chautauqua and Cattaraugus counties, and are making farming profitable. Artisans are reviving traditional specialty cheeses, and developing growing markets for their products, including shipping some items to the New York metropolitan market. A Greek-style yogurt, Chobani, is being produced Upstate by a recent immigrant, who has expanded his operation nationally. Often attributed to the region's semi-rural to rural character, there is more conservatism in culture and politics than found in the more urban downstate area, and the region is the power base of the state's Republican Party. Upstate New York does however have several Democratic-dominated counties, including Erie County (Buffalo), Monroe County (Rochester), Onondaga County (Syracuse), Tompkins County (Ithaca), and Albany County (Albany). As a whole, Upstate New York is roughly equally divided in federal elections between Democrats and Republicans. In 2004, John Kerry defeated George W. Bush by fewer than 1,500 votes (1,553,246 votes to 1,551,971) in the Upstate Region. New York City is dependent on upstate for a variety of services; the latter is the source of the city's water supply via the Delaware Aqueduct and the Catskill Aqueduct; much of the city's electric power supply comes from state owned hydroelectric plants at Niagara Falls and the St. Lawrence River; and most of the state's prisons are upstate; hence the popular term "being sent up the river" (however, the term originally referred to Sing Sing, which is "up the Hudson River" from New York City, but being in Ossining in Westchester County is still in the "downstate" region). Conversely, the operation of state facilities providing these services is an important part of the upstate economy. Francis Mallison of Rome. Journalist, editor and public servant. Editor of the Rome Sentinel, reporter for the Brooklyn Eagle. He and editor Joseph Howard, Jr. organized the "Great Civil War Gold Hoax", for which he was held as a prisoner of war. ^ "Upstate, downstate distinction raises questions". Recordonline.com. Retrieved October 23, 2016. ^ a b "What Area Is Considered Upstate New York?". The New York Times. Retrieved October 23, 2016. ^ "NYS Geography". How the Other Third Lives: A Focus on Upstate New York. Lewis Mumford Center, University at Albany. Retrieved November 6, 2015. ^ Technology and Steel Industry Competitiveness: Chapter 4. The Domestic Steel Industries Competitiveness Problems. Washington, D.C: Congress of the United States, Office of Technology Assessment, 1980, pp. 115-151. Retrieved December 27, 2015. ^ Leeman, Mark A. From Good Works to a Good Job: An Exploration of Poverty and Work in Appalachian Ohio PhD dissertation, Ohio University, 2007. ^ "The Role of Agriculture in the New York State Economy" (PDF). Osc.state.ny.us. Retrieved October 23, 2016. ^ a b c "New York's laws, like its residents, can't pin down 'upstate'". politico.com. ^ "NY Urbanized Area Maps : Area and Density" (PDF). Pad.human.cornell.edu. Retrieved October 23, 2016. ^ "What Area Is Considered Upstate New York?". The New York Times. February 14, 2016. ^ Court/District History. United States District Court for the Northern District of New York. Retrieved May 8, 2018. ^ "Where is upstate NY? Voters are split". democratandchronicle.com. ^ "Here's what New Yorkers think upstate New York is". The Washington Post. April 18, 2018. Retrieved April 18, 2018. ^ "Chevrolet Dealer In Attica Near Batavia - Upstate Chevrolet". Upstatechevyofattica.com. Retrieved October 23, 2016. ^ "Upstate Farms :: Welcome Back to the Farm". Upstatefarms.com. Retrieved October 23, 2016. ^ "VA Health Care Upstate New York". Visn2.va.gov. Retrieved October 23, 2016. ^ "Which county is the most Irish in New York state? (list)". Syracuse.com. Retrieved October 23, 2016. ^ Osborn, Liz. "Coldest Places in United States". Current Results. Retrieved October 23, 2016. ^ "Station Name: NY ALBANY AP". National Oceanic and Atmospheric Administration. Retrieved September 10, 2016. ^ "NowData - NOAA Online Weather Data". National Oceanic and Atmospheric Administration. Retrieved February 25, 2017. ^ "NowData – NOAA Online Weather Data". National Oceanic and Atmospheric Administration. Retrieved February 25, 2017. ^ "Station Name: NY BINGHAMTON". National Oceanic and Atmospheric Administration. Retrieved September 10, 2016. ^ "WMO Climate Normals for BINGHAMTON/EDWIN A LINK FIELD, NY 1961–1990". National Oceanic and Atmospheric Administration. Retrieved March 10, 2014. ^ "Iroquois Bio". Oswego.edu. Retrieved October 23, 2016. ^ "The Burning of Buffalo, NY". The Buffalonian. The People's History Coalition. Retrieved April 26, 2013. ^ Levy, Francesca (June 7, 2010). "America's Best Places To Raise A Family". Forbes.com. Retrieved October 23, 2016. ^ "Notes on Railroad Accidents - 1879". Catskillarchive.com. July 11, 2007. Retrieved October 23, 2016. ^ "All hotels in Playa del Ingles". Peace4turtleisland.org. Retrieved October 23, 2016.